Early last spring I was on a search for artists on behalf of two new Torrey exhibition venues. A friend had mentioned that I needed to see the work of two artists in Escalante – so one beautiful day I cruised down Highway 12 (one of the most scenic roads in the United States) to meet furniture artist David Delthony and his wife Brigitte, a ceramist, art teacher and therapist. Their 20-acre property is just west of town. The Delthonys had arrived in southern Utah in 1996 from Germany and had shipped David’s massive woodworking equipment, and Brigitte’s art workshop and all their household belongings in two overseas containers. As new pioneers to remote canyon country, they quickly built an expansive workshop, established a vegetable garden for themselves, adopted two lively dogs and restarted the careers they had left behind in Germany. As a former furniture designer with an MFA in ceramics, I found I found I had much to talk about with the Delthonys. I was very enthusiastic about David’s beautiful sculptured wood furniture and Brigitte’s evocative primitive pottery forms. David’s upcoming exhibition at the Utah Arts Council’s Rio Gallery provided me an impetus to sit down with David and talk at length about his work. 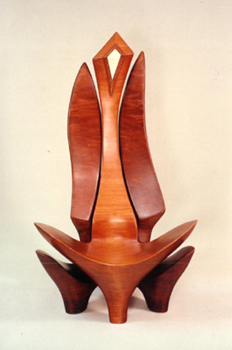 KK: David, you have been creating your unique “Sculptured Furniture” for almost 25 years and have just this year received the Utah Arts Council Fellowship award. In your biography I see mention of New York, Turkey, Berlin, and just recently, Escalante, UT…….could you tell us something of the career path which has brought you here? 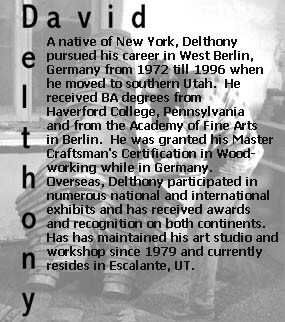 DD: I was born and raised in New York and from an early age had a definite interest in wood and working with my hands. While receiving my B.A. at Haverford College in PA, my interests developed further in the directions of art, ceramics, sculpture and woodworking, but I was not yet ready or able to undertake this path. After serving two years in the Peace Corps in Turkey, where I also worked with local village potters, I returned to New York with an increased desire to pursue an artistic career. Working out of my basement shop (and sometimes outside in the driveway where I almost lost a finger to the saw), I designed and built furniture, getting small commissions by word of mouth. Fortunately I realized after a year that my self taught skills and knowledge of woodworking were in- sufficient. Lacking the funding to attend a degree program in fine wood- working in the US, I turned to the “old world” which was still renowned for its educational system of teaching fine craftsmanship and moved to West Berlin, Germany. KK: What made you choose Germany and West Berlin? DD: I was very inspired by the German “Bauhaus” tradition of combining workshop experience and extensive material knowledge into art and design instruction, and for someone in their late 20’s the divided city of Berlin was a unique and inspiring environment. At that time, higher education in Germany was sponsored by the state, so it was possible to attend a university and cover other living expenses with part time jobs. I enrolled in the Academy of Fine Arts, receiving my degree in interior design in 1975. Unfortunately, in the Academy I didn’t encounter the combination of craftsmanship and artistic design I had expected so I turned to the time honored German apprenticeship system, working in various woodworking shops and eventually receiving my Master Cabinetmaker accreditation. Armed with the traditional skills of the trade, I then set up my own shop in an old factory floor near the Berlin Wall in a section of town which had been vacated by business during the Cold War and had been inundated by artists who sought the atmosphere and low rents. KK: This sounds like a long journey back to the roots of your artistic aspirations. Were you then able to utilize your accreditation and skills as an Interior Designer and Master Cabinetmaker? DD: In general yes, because I now had the ability and knowledge to undertake projects I had only dreamed of before. But instead of taking on traditional commissions which might have produced a steady income, I immediately decided to venture into the world of art, abandoning conventional rectilinear forms and beginning to sculpt with wood. My initial pieces were large works for children to play on, which I first exhibited in Berlin and later in West Germany. Since the physical process of creating my art work –sawing, jointing, planing, laminating, chain sawing, sanding, finishing – requires many tools, I simultaneously became a habitual visitor at junk yards and business closings, collecting almost all of the heavy machinery and hand tools I needed. Due to the ongoing reconstruction after the war, Berlin was an unbelievable source for used machinery, making it easier for me to build the physical foundation for my work there than it would have been anywhere else. KK: I know that it is difficult to make a living as an artist doing this type of work, but you stayed true to the concept of creating Sculptured Furniture. Would this be an accurate description of your development? 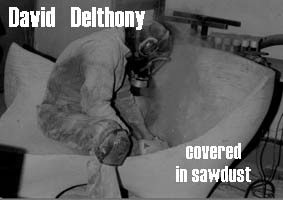 DD: Yes, once I had the knowledge, training and equipment to work sculpturally with wood, I put my energy into following this path, concentrating my efforts into creating and exhibiting my work, developing new techniques for making sculptured furniture, and improving upon the equipment I needed for my work. 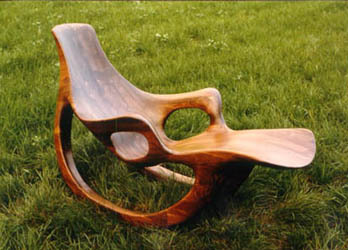 I continually deepened my own knowledge and expanded upon the possibilities I saw in sculpting furniture in wood. In a certain sense, “Sculptured Furniture” became my life. KK: During your 25 years in West Berlin, you exhibited extensively at shows and fairs all over Germany as well as in Europe – almost yearly at the international furniture and art fairs in Cologne, Munich and Milan as well contributing to “Made in Germany” art and craft exhibits worldwide (even as an American living in Germany!). You also received a great deal of recognition in the media, won prizes and your name was associated by many with “sculptural woodworking.” What made you leave all of this and move to Escalante, UT in 1996? DD: A number of factors contributed to this. A few years before the Berlin Wall had come down, and although this was of course a positive development, it also brought tremendous changes to the city – congestion, traffic, construction and rising costs. The factory floor my wife and I had rented became unaffordable as big business returned to the city and literally displaced many artists. We realized that we too would have to make a major change and for a myriad of reasons, decided to move to a rural location. Having been fascinated on vacation trips through the southwest by the canyon country and the possibility of a more sustainable life style, we made the radical decision to relocate to a remote section of southern Utah. 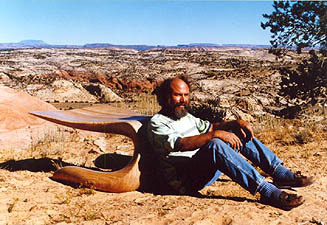 KK: I was interested to read an article about your work in the Salt Lake Tribune (11/2/98), in which Joan O’Brien commented, “Long before David Delthony moved to southern Utah, he was sculpting furniture reminiscent of the red-rock country.” Were you influenced by this landscape? DD: As Joan aptly indicated, I had developed my visual language long before seeing the awe-inspiring formations in southern Utah, but obviously my Sculptured Furniture was originally influenced by a similar perception of nature and biomorphic forms. 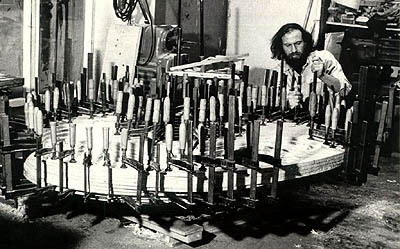 I have also been inspired by sculptors like Moore, Brancusi and Arp as well as by other woodworking artists like Wendell Castle and Sam Maloof. KK: You refer to your art as “Sculptured Furniture”. Could you describe your work for us? DD: As a furniture artist, I sculpt with the material wood, investigating interior space and defining exterior boundaries. My work focuses on the dialog between functional and aesthetic values as I try to incorporate and balance these in each object. It is important for me to utilize my knowledge of the material wood and of ergonomics to create organic forms which engage the user through their function and my own personal visual language. As I work within the syntax of fine furniture, I endeavor to infuse my work with an artistic sensuality, embracing visual and tactile senses and encouraging the human contact which is essential to my vision as an artist. KK: The “art world” often ignores or attempts to discredit what could be termed functional art or artistic furniture. What are your feelings about this? DD: It seems that in our contemporary society, when an object takes on any type of functional characteristic, it loses recognition as an artistic expression. If we look back to prehistoric cultures, especially African, we can see that the origins of furniture were closely related to rituals, mysticism, and artistic expression. The first chair or stool in early cultures was created by artists and craftsman for the tribal leader to elevate him and symbolically represent his position in the community. 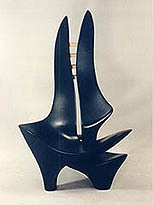 Following this example of the “chair”, the correlation between function and artistic creation is even obvious in more modern monarchial societies where a throne evolved out of the original symbolism of the stool. In my own work, I have even done a series of “King’s Chairs” which relate to this theme. Unfortunately for many people though, the idea of “functionality” seems to be a negative characteristic in the art world. From my own experience though, adding a functional at- tribute without sacrificing artistic values can be an elevating and dynamic feature as well as an extremely challenging task. KK: I agree with you entirely. To me one of the strengths of your organic and sensuous forms is that they are successful as artistic statements and as functional entities. Neither aspect is sacrificed or relegated to a secondary position. What do you see as the responsibilities of the artist as opposed to the craftsman? DD: Most important would be the unique sensibility of the artist and the successful expression of this sensibility in his personal style or visual language. A furniture maker who did not develop this unique sensibility and made purely utilitarian furniture would not fulfill this requirement. Whether the expression of the artists sensibility is “successful” or not is extremely subjective, but it should not to be measured by commercial or financial acclaim. Decisive is that the finished work somehow reach out, touch and evoke a response in the observer. KK: There are pieces of fine workmanship, made by excellent craftsman who do have their own style. Are there other features which can also be used when examining the questions of art, art furniture, and craft? DD: I think there is another characteristic which separates the artist from the craftsman and that is the artist’s emphasis on the creative process. For the artist, the creative idea is actually the driving force and takes precedence over function, craftsmanship or material. He may be bound by a utilitarian purpose or the use of a specific material, but more decisive for the artist is that he express his idea through a creative process. Functional values and mastery of the craft, although often central in furniture art, serve as tools for the realization of the artistic expression and should not become the end product. Unfortunately in certain disciplines, these very tools have become an impediment to being accepted in the world of art. KK: As someone who has been closely associated with galleries and exhibition venues, I realize how few opportunities there are to display functional art as opposed to what some would term “pure” art. Do you think it possible that we develop an expanded consciousness for the concept of art and that functional art and art furniture be included in this definition? DD: Yes, there are definite developments in this direction, especially within the furniture arts. An increasing number of educational institutions are combining high quality instruction in the crafts within their art curriculum. There are also a number of important societies, organizations and publications (for example, the American Craft Council and the Furniture Society) which promote the functional arts and where appropriate, their inclusion in the art world. The recognition of artists like Dale Chihuly, Betty Woodman, Peter Voulkos and Wendell Castle, who had their origins in functional art, contributes to the public awareness of functional art, but still, when seen as a whole, there is a lot of educational work yet to be done. After his upcoming exhibit at the Utah Arts Council’s Rio Gallery, David’s work can be seen in southern Utah in Torrey Home & Garden and Brigitte’s can be found at Gallery 24 as well as in their own Escalante studio. This interview was conducted by Karen Kesler, designer, painter, object-maker and partner in the recently opened Gallery 24 in Torrey, Utah. All artwork is copyright David Delthony and may not be reproduced without written permission.